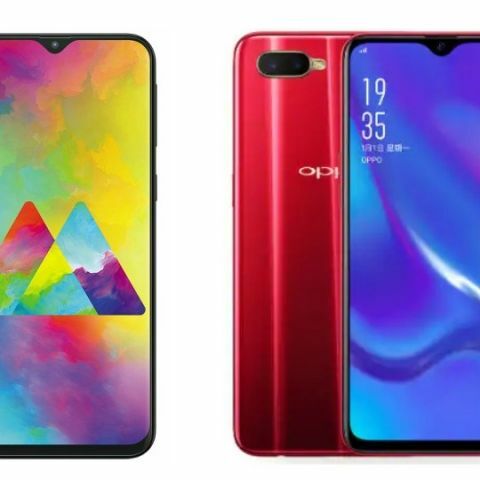 Recently, Oppo and Samsung have launched their latest mid-range devices in India Galaxy M20 and Oppo K1. We are comparing these two devices to see which one is better when it comes to hardware? Recently, Samsung has launched two new devices under its M series- Galaxy M10 and M20 among, which the M20 is the premium one. The device is starting from Rs 10,990 in India and going up to Rs 12,990 for the 4GB/64GB variant. On the other hand, we have the latest Oppo K1, which is the most affordable device in the market currently that comes with an in-display fingerprint sensor. 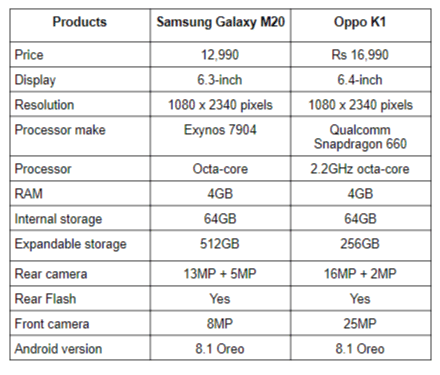 So, let’s begin with comparing the specifications of these two devices to know which one will be the better choice for you if you have a limited budget? The Samsung Galaxy M20 sports a 6.3-inch FHD+ display that comes with a notch on top of it. On the other hand, the Oppo K1 has a slightly bigger 6.4-inch display that offers a resolution of 1080 x 2340 pixels and sports a tiny dew-drop notch on top of the display. When it comes to the processor, the Samsung Galaxy M20 is powered by an Exynos 9704 octa-core processor, which is paired with 4GB RAM and 64GB internal memory that is expandable to up to 512GB via a microSD card. On the other hand, the Oppo K1 is backed by a Qualcomm Snapdragon 660 processor that is coupled with 4GB RAM and 64GB internal memory, which can be expanded to up to 256GB via a microSD card. Coming to the cameras, the Samsung Galaxy M20 sports a dual 13MP + 5MP camera setup on the back along with an 8MP sensor on the front for clicking selfies. On the other hand, the Oppo K1 features a dual 16MP + 5MP rear cameras and has a 25MP unit on the front.